“We are a nation of immigrants and a country of laws. This case has always been about protecting our most vulnerable residents and checking the president’s abuse of power. The president cannot simply grant himself authority that he doesn’t have under the Constitution. Democracies don’t work that way. That is why San Francisco stood up to protect billions of dollars that help provide basic necessities for some of the most vulnerable Americans. We’re talking about low-income families, seniors, foster children and people with disabilities. This is money that helps provide food, health care and a roof over their heads. It’s money that pays for bridges and public transit. Those are the programs this administration targeted in its cynical attempt to vilify immigrants. Because San Francisco stood up, and communities like Santa Clara County joined us, the U.S. Department of Justice is now backtracking and saying this executive order doesn’t apply to most federal funding. Unfortunately, saying ‘trust us’ just doesn’t cut it. 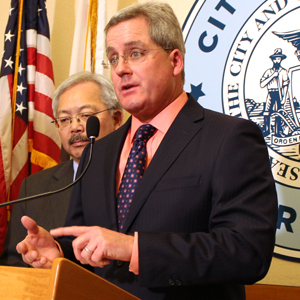 That is why the people of San Francisco — and across this country — need the certainty of a court order. But our teachers, doctors and police officers cannot be conscripted into becoming a deportation force. San Francisco’s sanctuary policies make our city safer by encouraging anyone who has been a victim or witness to a crime to tell police. We are a safer community when people can report a crime, bring a loved one to the doctor or take their kids to school without worrying it could lead to a family member being deported.